Confocal microscopy for thick samples. 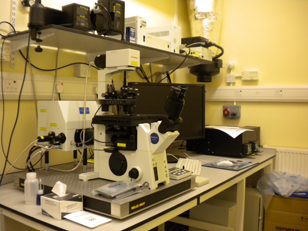 Confocal microscope for live cell and DNA damage experiments. epifluorescent microscopy for thin samples. The FV1000 confocal enables imaging of thick specimens as well as fixed cells stained with standard fluorophores. Mounted on an inverted microscope, the motorized stage can be used for image stitching of large samples and imaging at multiple positions. Accompanying Imaris Software is available for 3D image reconstruction. In addition the FV1000 is fitted with a Becker and Hickl FLIM system for fluorescence lifetime imaging. Imaging fixed cells and tissue sections labelled with 3 or 4 fluorophores. For investigating cellular architecture, localisation or co-localisation. 3D Imaging of thicker samples such as organoids, embryos etc. Imaging larger structures such as organ slices using image stitching. Imaging multiple points on a slide. FLIM imaging for accurate FRET interactions or assessing local fluorophore environment. Cox, G. Biological confocal microscopy. Materials Today 5: 34-41 (2002). Protein localization in living cells and tissues using FRET and FLIM. Chen Y, Mills JD, Periasamy A. Differentiation. 71(9-10):528-41 (2003). Single molecule fluorescence in situ hybridisation for quantitating post-transcriptional regulation in Drosophila brains. Yang L, Titlow J, Ennis D, Smith C, Mitchell J, Young FL, Waddell S, Ish-Horowicz D, Davis I. Methods. 126:166-176. (2017). Neural circuitry coordinating male copulation. Pavlou HJ, Lin AC, Neville MC, Nojima T, Diao F, Chen BE, White BH, Goodwin SF. Elife 5. pii: e20713. doi: 10.7554/eLife.20713. (2016). Lhx1 functions together with Otx2, Foxa2, and Ldb1 to govern anterior mesendoderm, node, and midline development. Costello I, Nowotschin S, Sun X, Mould AW, Hadjantonakis AK, Bikoff EK, Robertson EJ. Genes Dev. 29(20):2108-22. (2015). Cardiac lymphatics are heterogeneous in origin and respond to injury. Klotz L, Norman S, Vieira JM, Masters M, Rohling M, Dubé KN, Bollini S, Matsuzaki F, Carr CA, Riley PR. Nature. 522(7554):62-7. (2015). Phosphorylation of iRhom2 at the plasma membrane controls mammalian TACE-dependent inflammatory and growth factor signalling. Grieve AG, Xu H, Künzel U, Bambrough P, Sieber B, Freeman M. Elife. 6. pii: e23968. (2017). Nuclear phosphorylated Dicer processes double-stranded RNA in response to DNA damage. Burger K, Schlackow M, Potts M, Hester S, Mohammed S, Gullerova M. J Cell Biol. 216(8):2373-2389. (2017).